The Inter-Integrated Circuit (often shored as I2C or I2C bus pronounced I-squared-C or alternatively I-two-C) is a widely used synchronous serial communication peripheral which communicates in half duplex mode using a multi-master-multi-slave architecture. Like the SPI, the I2C is a Synchronous Serial bus, and the clock signal is generated by one of the endpoint and provided to the others through a specific Serial Clock Line often shorted as SCL by a party which is named Master. In half-duplex buses, the communication happens on the same line no matter the direction. The I2C uses indeed a single data line known as Serial Data often shorted as SDA. The slave selection happens sending additional data along with information and implementing a protocol: no additional wires are required and I2C is often called two-wire serial in contrast to the four-wire one (the SPI). The whole I2C communication happens on the two wire which can be driven by all the bus contenders. To avoid short circuits the I2C uses open drain lines with pull up resistor with typical voltages of 3.3 or 5 V: when bus is in idle condition both SDA and SCL assume an high logic value. Each I2C transaction begins with a Start condition (SCL high and SDA moves from high to low) and ends with a Stop condition (SCL high and SDA moves from low to high). A transaction is composed by one or more messages where each message is 1 byte word (8-bit) plus an addition bit which has the purpose to guarantee synchronization between master and slave: Acknowledge/Not acknowledge (ACK/NACK) bit. The communication cannot stop in the middle of the transaction: To prematurely abort the operation the receiver as to issue a NACK and after that the master has to issue the Stop Condition otherwise the bus will be in an undefined condition. The first two word are used to establish the slave to which the communication is addressed, the type of communication and indirectly the number of messages of the transaction. Such addition data is usually know as protocol overhead. The first byte includes the Slave Address (shorted as SAD and having usually 7-bit lenght MSB bun in certain cases also 10-bit) and a read/write bit (R/W 1-bit LSB where read is 1 and write is 0). If slave is a device having registers, the second word is often used to issue which slave sub register the master wants to read/write (often shorted as SUB). At this point in case of read the slave will reply a certain number of messages and the master has to provide clock for each messages, in case of write the master will send a certain number of messages. Communication always ends with a stop condition. While some of these stuff are well specified by I2C standard others depends on slave thus you should always refer to their user manual. Note that if a device is I2C compliant will most likely be aligned to the I2C specification. 3.4 Mbit/s in the High Speed mode. Anyway note that these values refers only to clock speed and thus does not take in account protocol overhead as well as clock stretching and other condition which makes the actual baud rate lower than the selected value. to programmable clock stretching and hold/setup time (only I2Cv2 and I2Cv3). Note that STM32 offers many I2C instances (from 2 in the small packages up to 4 in larger packages). I2C cells are identified with a progressive number (i.e. I2C 1, I2C 2, I2C 3 and so on). Note also that I2C bus relies on GPIO alternate functions to be able to get in touch with the outside world. The current ChibiOS I2C driver allows only master mode offering a simple interface to use I2C in synchronous way only. Each API of the I2C Driver starts with the prefix “i2c”. Function names are camel-case, pre-processor constants uppercase and variables lowercase. The whole driver subsystem can be enabled disabled through the proper switch in the halconf.h. The switch name is HAL_USE_I2C. To use the driver we have then to assign it a I2C peripheral acting on mcuconf.h. Assigning a peripheral a new object will become available: I2CD1 on I2C 1 assignation, I2CD2 on I2C 2 and so on. 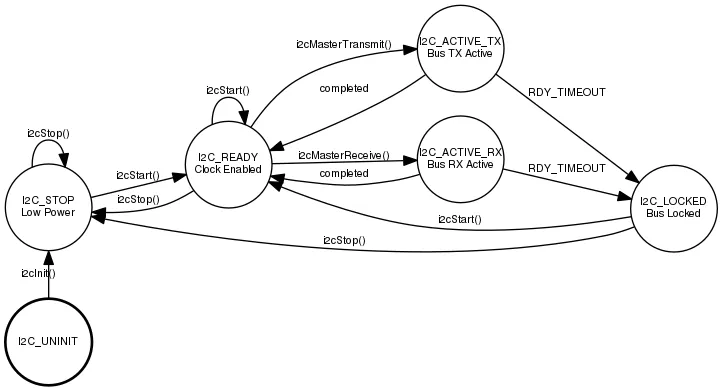 Each I2CDx object represent a driver which implements a Finite State Machine. Each driver operation (e.g. a master transmit) can be done only if driver has been properly started. This requires a call to i2cStart(). The i2cStart() receives as usual two parameters: a pointer to the driver and a pointer to its configuration. If the driver is not used it can be stopped through the i2cStop(). The following figure represent the state machine of the driver. The I2C configuration structure has not some common fields but it depends entirely on hardware. The configuration is completely different between I2Cv1 and I2Cv2/I2Cv3 (which has the same configuration structure). * @brief Type of I2C driver configuration structure. uint32_t clock_speed; /**< @brief Specifies the clock frequency. * @brief Supported modes for the I2C bus. As side note the SMBUS is a lightweight communication bus derivative of I2C usually found in computer motherboards. It is used for communication with the power source transmitting ON/OFF instructions. In 99% cases we have to use complex devices which relies on I2C mode. The second parameter is clock_speed and is a number representing the baudrate. Many devices communicates in standard mode (100 kbps i.e 100000) or fast mode (400 kbps i.e 400000). * @brief Supported duty cycle modes for the I2C bus. In Standard mode we should select STD_DUTY_CYCLE while in Fast mode FAST_DUTY_CYCLE_2. * @brief TIMINGR register initialization. * by the system clock settings in mcuconf.h. * @brief CR1 register initialization. * @note Leave to zero unless you know what you are doing. * @brief CR2 register initialization. * @note Only the ADD10 bit can eventually be specified here. The first parameter is timingr which represent the value of the I2C Timing Register. It allows to apply some fine tuning to the clock speed, hold and setup time. Bit fields are described in manual and it offers also a series of formula to compute the high and low period as well as rising and falling time. These register offer a lot of flexibility but are very difficult to be configured especially the first one. My suggestion is to refer to testhal demo for STM32 equipped with I2Cv2 (e.g STM32F3) to copy a working configuration an adopt it in your project: this would work almost always. The master send/receives n words. * @brief Sends data via the I2C bus. * than set @b rxbytes field to 0. * - @a TIME_INFINITE no timeout. * @return The operation status. * @retval MSG_OK if the function succeeded. * be retrieved using @p i2cGetErrors(). * @retval MSG_TIMEOUT if a timeout occurred before operation end. * @brief Receives data from the I2C bus. * @brief Wrap i2cMasterTransmitTimeout function with TIME_INFINITE timeout. * @brief Wrap i2cMasterReceiveTimeout function with TIME_INFINITE timeout. which actually are re-definitions of the previous presented functions with TIME_INFINITE timeout. To conclude, note that these functions return a message which relies on ACK/NACK. This is interesting because in case of communication error software can take an action based on the error flag. * @brief Returns the errors mask associated to the previous operation. * @return The errors mask. The driver offers also a couple of API to acquire and release the bus: i2cAcquireBus and i2cReleaseBus. * @brief Gains exclusive access to the I2C bus. * is already being used then the invoking thread is queued. 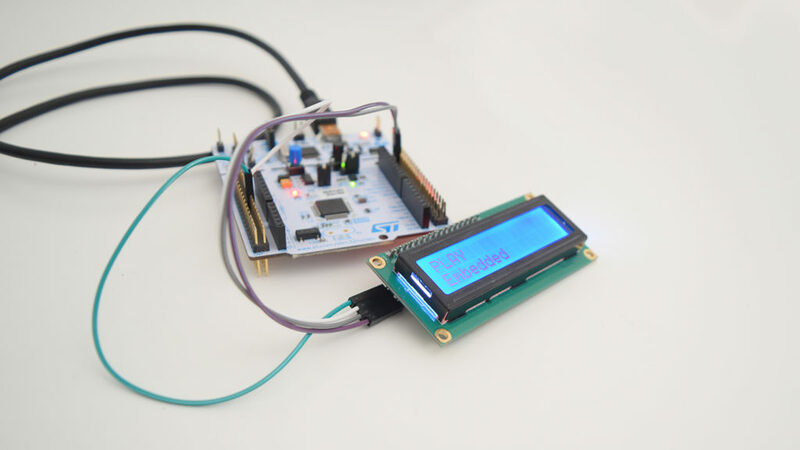 * @brief Releases exclusive access to the I2C bus. Such functions are useful when the same I2C driver is used from two threads because they guarantee that none will use that I2C driver until it is acquired avoiding misbehaviour due to concurrent access. Note that these API requires I2C_USE_MUTUAL_EXCLUSION is set to TRUE in the halconf.h file. We have already planned a collection of example and exercises for the I2C driver. If you are interested in follow us on Facebook to be updated on our articles. Anyway, at this moment you could refer to the I2C demo under testhal to give it a try. You can also try the demo under testex for STM32 Nucleo with external x-Nucleo IKS01A1 or IKS01A2 which are expansion board equipped with MEMS which communicates over I2C. Even STM32F3 Discovery which uses I2C to communicate with LSM303DLHC: this is a 3-axis accelerometer + 3-axis magnetometer connected to the MCU through the I2C. Basically the chip acts like two separate slaves having different registers and different Slave Address.